FastBall 2 by Klik! Games is a title that has been on iOS for quite a while and is now on Windows Phone. Played by over 3 million people on multiple platforms, it falls under the category of “time-waster games” (that I love) and its quick gameplay and simple control scheme make it a good one. 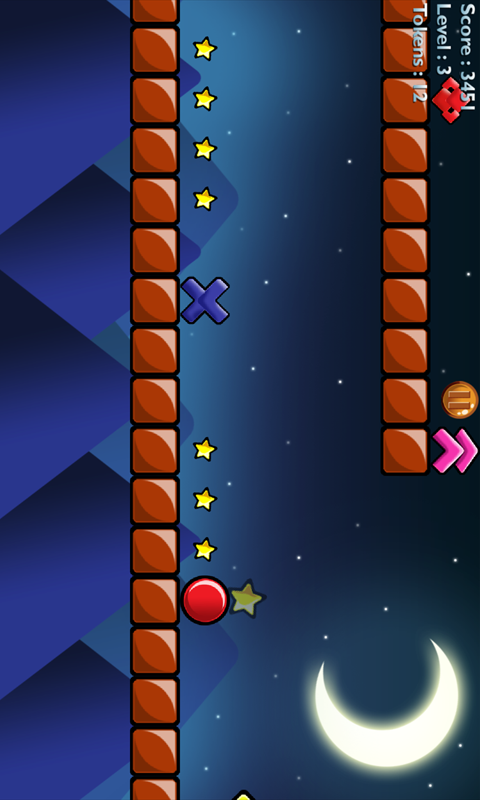 The idea of the game is to get your rolling ball from one end of the level to the other by avoiding obstacles. You achieve this by using your only ability, which is to jump. As you roll, you will hit boosts to pickup speed and then some which will slow you down, drop you and lift you up to reach higher platforms. As you progress through each of the available 105 levels, the games picks up in speed and difficulty becoming very difficult, very fast. 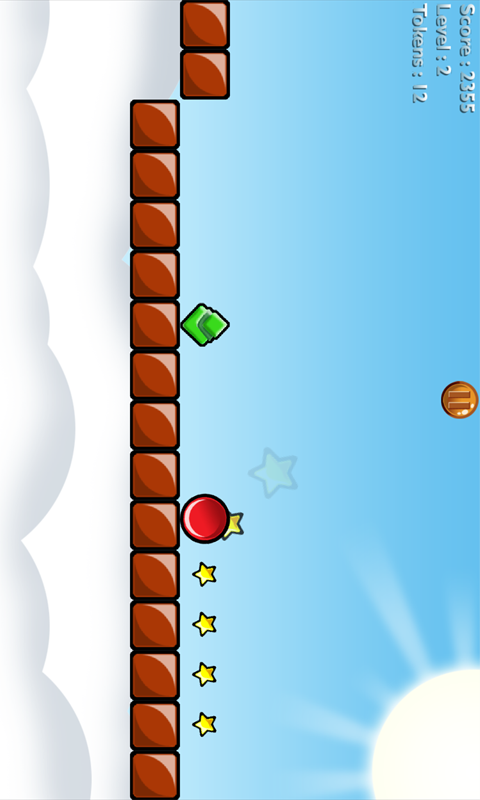 If you just cannot get by a level, you can use tokens, which you will achieve, to skip over levels. The visuals are well-done and are reminiscent of a level from games like Super Mario, except the gameplay is very different. There are two themes: cartoon and futuristic, which mix up the look and feel of the game just enough. The ball rolls smooth and the physics match the gameplay and speed perfectly. Fastball 2 is a great little indie title for Windows Phone that many have found to be an excellent little time-waster. Best of all, it’s free. FastBall 2 is an ad-supported, free title and is available in the Marketplace by searching for “FastBall 2” in the Zune PC software or on your Windows Phone. In order for Windows Phone to really shine over iOS in the mobile gaming department we need titles that are both exclusive and excellent. Tentacles, by developer Press Play, is exactly this kind of title and the exclusive that will make Windows Phone the portable Xbox machine we know it to be. Press Play already had an extremely fun Windows Phone title in Max and the Magic Marker and now their follow-up title continues that quality gameplay and adds in a bit of uniqueness to the mix. After enjoying Press Play’s previous title for Windows Phone, I knew that we were in store for a stunning game, but the surprise of Tentacles is that it’s a mobile game that’s never been done before. I’ve played a lot of mobile games. Some clones of others and some just an evolution of former titles, but Tentacles is a new thing altogether. 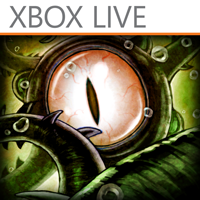 The gameplay and control scheme make Tentacles one of the best Xbox LIVE games on Windows Phone and the subtle music and inventive storyline add nicely to the overall experience. In Tentacles, you are Lemmy, a creature made from the parts of a few different species in a genetic experiment gone awry. With a strange appetite for eyeballs and an octopus-like appearance, you meander through the body of your creator, Dr. Phluff, seeking to find an escape. 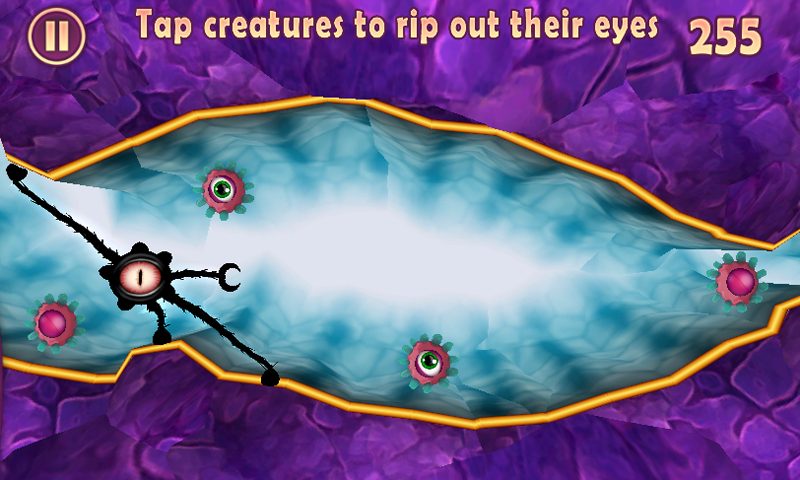 You must make your way through 40 detailed levels eating eyeballs and avoiding obstacles and disasters along the way. The controls are one of the features that really stand out when you first pick up Tentacles. Lemmy will grab onto the walls of the passage ways you traverse and you’ll move the creature forward by tapping the walls and ledges in front of the creature. 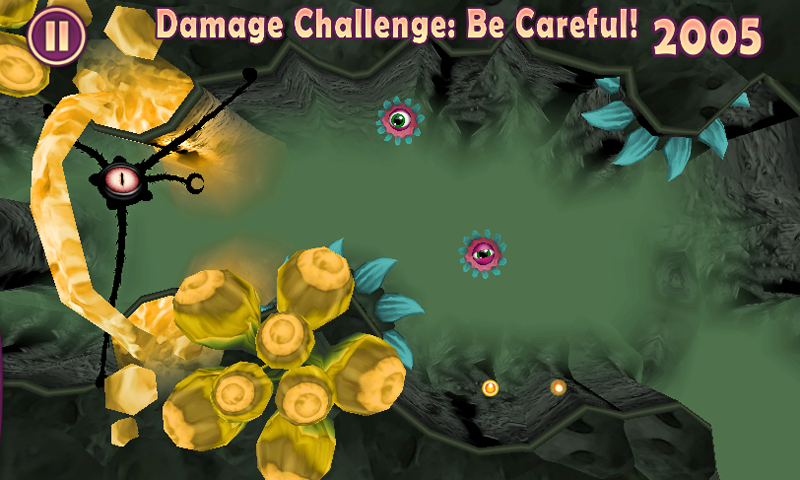 As you progress into the game, you must avoid obstacles which will inflict damage and sometimes you must move through the level in the shortest amount of time possible. You are also blessed with a single claw which you can use to battle enemies and reach out and grab eyeballs that you’ll find along the way. As for the performance of tentcles, the title ran smooth and had exceptionally quick load times on the NoDo and Mango beta devices I tested. Responsiveness to controls and finger presses were also extremely accurate. Even better yet, Tentacles does have lasting value because the levels, bosses and achievements are varied in such a way that you’ll keep coming back to better your time and earn three stars on each of the 40 levels. Overall, Press Play did it again and delivered a homerun with Tentacles. This is one title that deserves recognition and downloads and at $4.99 with a free trial, there is no excuse not to give it a try. I hope that this is just one of many titles we’ll see from the Copenhagen developer for the Windows Phone platform. You can find this must-have title by searching for “Tentacles” in the Zune PC software or on your Windows Phone. Click here for the Interview I had with the Director and Lead Designer for Tentacles for an inside look at the games development and decision making. Here is an excellent game that has been in the Marketplace since January 4th and I’d never even realized it had existed until last night when I was browsing through the top rated games in the Marketplace. 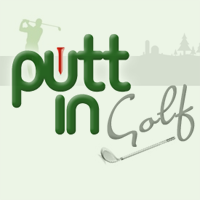 Putt In – Golf by publisher 7.1.M. is a “putt putt” golfing game for Windows Phone which uses 3D graphics, realistic physics and dynamic scenery to make for a great-looking golf title. There are three modes: Normal, Trophy Course and Obstacles and currently 36 different courses to play through. The gameplay is similar to the excellent Xbox title Fable: Coin Golf where you tap the golf ball and pull back using your finger to apply direction and power to the swing. 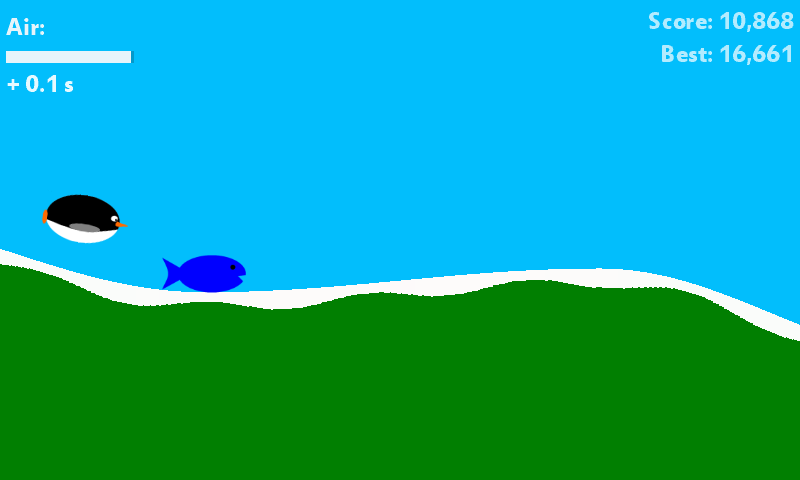 I found the graphics to render smooth and true and the controls to be very simple to pick up. There are also online leaderboards available so you can upload your scores and see how you compare against others around the world. I can highly recommend this title for Windows Phone and judging by the other users’ reviews of this game, I believe they would too. For only $1.29, you are getting a solid, frequently updated game that you can use to impress your friends on the capabilities of the Windows Phone OS. The title is currently at version 2.1 and has been consistently updated to add improvements and more courses. You can find this game for $1.29 (w/free trial) by searching for “Putt In – Golf” in the Zune PC software or on your Windows Phone. Mango packs about 500 new features into Windows Phone, per Microsoft, so picking one favorite is quite difficult, but if someone cornered me and forced me to do so, I’d probably have to cave and say Internet Explorer 9 mobile. In the initial release of Windows Phone 7, the browser included was a hybrid of IE7 and IE8 and was still better than most browsers on other platforms out there, but it certainly had its flaws. Microsoft hopes to close some of those gaps with IE9 in the Mango release. I’ve had some time to play with the Mango beta and I’m pretty pleased with the direction of the native browser. Here are my thoughts. The con with the new layout is that the favorite, add favorite and recent buttons have now been relegated to a sub menu which appears when you press the “…” button. A menu comes up with IE’s browser options: tabs, recent, favorites, add to favorites, share page, pin to start and settings (Another change I noticed is that when the menu bar is up a small status bar drops from the top of the screen with your time, battery, wi-fi and carrier signal strength). What this means is that you must tap the “…” button, pull up the menu and select “Tabs” to navigate to the tabs page, when before, it was just a tap at the bottom of the screen. Not a huge issue, but a noticeable extra tap. The pivot for favorites/history is now also removed in the beta, so instead of being able to switch back and forth between the two on a single screen, you now have to go back to the toolbar menu and select them individually. Real world usability for IE9 is close to the previous version in Windows Phone except it does seem a bit faster at loading pages thanks to the now full GPU hardware acceleration baked in. Pinching and panning is smooth like butter and even better in this release. Flash support is still not included and may never be for that matter, but we’ll have to wait and see there. HTML5 is the new technology being touted in this version. 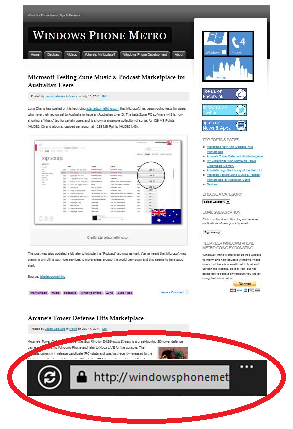 Microsoft has recently gone full steam ahead with their support for the HTML5 markup and it’s evident in IE9 mobile. Being a mobile browser, you may not notice most of the HTML5 goodies (HTML5 test site here), especially if you are like me and have the browser set to mobile web-page view by default, but it’s nice to know that the HTML5 capability is there. Rendering is much better on many webpages in this version of IE. The only exception, for me, is the mobile version of Yahoo!, which renders as a text-only mobile webpage. Every other site I’ve tried renders beautifully. In conclusion, the new and improved Internet Explorer mobile for Windows Phone Mango is definitely an upgrade over the previous version in initial releases of the OS. The speed, compatibility and standards compliance is greatly improved and the new location of the address bar is refreshingly welcome, even if it means a few more taps to get to some options. IE9 mobile is just one of the major changes coming in Windows Phone this Fall and I can’t wait to see what the Windows Phone team hasn’t yet revealed. Physics-based games are a great fit for a mobile platform and Windows Phone will undoubtedly need to continue adding quality Xbox LIVE-enabled and indie titles from this genre in order to keep up with the major players like iOS and Android. 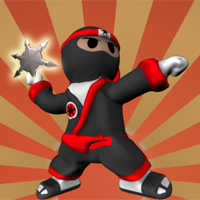 Star Ninja by Bounding Box Games LLC does a great job of bringing yet another physics title to Windows Phone. 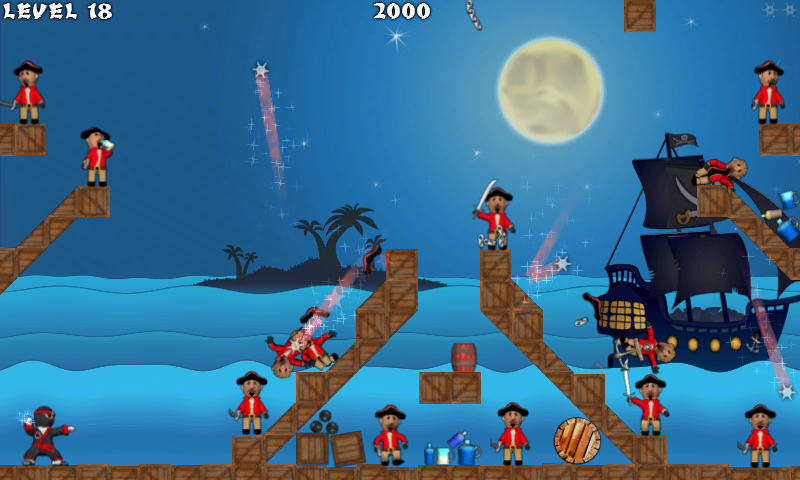 The object of Star Ninja is to aim and throw ninja stars off objects and walls in order to knock down pirates which have been placed through each of the 50 levels. Some pirates are out in the open and easy to hit and others are behind objects and obstacles and take a little more thought to knock down. The visuals are very well-done from the opening animated menu screens to the moving backgrounds in each level. The game runs smooth on both NoDo and Mango beta devices that I’ve tested even when there is a lot happening on the screen at once. The controls are easy to learn and use and seem to fit the gameplay design perfectly. You simply drag the aiming target to the spot you wish to throw and tap your ninja to release the throwing star, couldn’t be simpler. The gameplay stays fresh with 50 unique levels and four different gameplay modes: Focus, Frenzy, Campaign and Speed Run. Overall, I enjoyed the title. I appreciate when it’s obvious that a developer put a lot of time and thought into their game and the visuals and fluid gameplay seem to prove that in Star Ninja. if you are into physics-based games like iBlast Moki and Angry Birds, then Star Ninja might be right up your alley. At $1.29 the title is right in the sweet spot of affordability and with a free trial you have no excuse not to give this indie developer a download. You can find this title by searching for “Star Ninja” in the Zune PC software or on your Windows phone. By now, you’ve probably read countless and seemingly endless articles on other sites about the Mango update detailing every feature and menu option. My goal here, after having spent some time with Mango, is to generally and briefly summarize my thoughts on the beta and how it bodes for the final release later this fall. Everything is smoother and more fluid than NoDo. Menus in both native and third-party apps scroll without stuttering and feel much more responsive. The phone seems to boot and shut down faster than before, although I have not timed it officially. IE9 is excellent and having the toolbar and address bar combined into one really give you more viewable space for web browsing. I originally didn’t like the idea of the address bar moving to the bottom of the screen, but I really like the new placement after using it. Some web pages that rendered improperly before, now render correctly. Bing Vision, Scout, Music and Voice are incredible, useful built-in features. The Office hub now feels complete with the integration of SkyDrive and Office 365. The Games hub is better than ever and includes everything in the native hub. The Messaging app in Windows Phone is simply the best way to message and IM on any device. The People hub has some minor, but welcome changes and the groups option is very nice. The little things you will notice as you use the device will start to stand out and impress. I’m sure I’ve missed some cool features and changes, but I wanted to keep this brief. Mango is currently in beta, so any cons I may have come across may be fixed in the final release. The cons to Mango are few and far between, but there are some small bugs and annoyances. Since the address and toolbar for IE9 has been combined into one bar the options for tabs and favorites have been moved into a sub menu only accessed when the “…” is pressed. This makes for more finger taps to access each option. The letter jumplists in the apps menu may take some getting used to. I was accustomed to swiping through my apps list and it seems to take longer to remember which letter to press. I’m sure this will grow on me, but it’s tough to get used to at first. Multitasking in Mango is incomplete because most third-party apps have yet to be optimized for quick resume (see comments). I actually find myself using the back arrow to return to apps more than using the multi-tasking card view screen. Update: I’ve run into a major problem with Windows Live Messenger in the Mango beta. I can’t seem to get nearly any of my ‘online’ contacts to display as being ‘online’ and available for chat and the ‘chat’ option doesn’t appear next to almost all of my Windows Live/Messenger contacts in the people hub. It seems many others are having this problem as well, so hopefully the issue will be fixed come release. Mango makes some minor and major changes in different places throughout the OS, but its impact on the overall experience is completely positive. 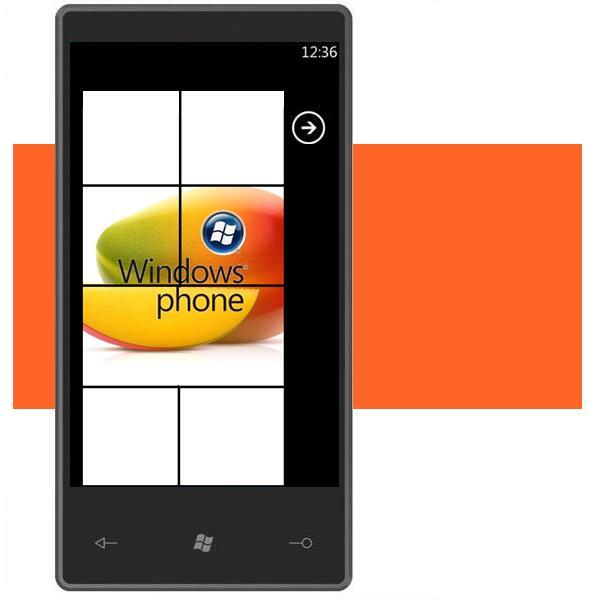 Once mango is completed and shipped to consumers it will definitely legitimize Windows Phone as the major contender we already know it to be. Fall 2011 can’t come soon enough. Mango and football season…what’s not to like about that. Please feel free to comment on a post, use the form on the About page or ask a question via Twitter or Facebook if you have any questions about features or changes in the Mango beta and I’ll do my best to answer them. This was kind of an impromptu review, but I was recommended this title by a friend and found it such a great little time-killer that I thought it would be a great recommendation. The game I’m referring to is called Penguin by creator Mike Newman. 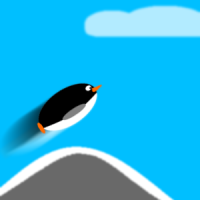 The idea of the game is to glide and guide your penguin over valleys and hills and through the air and basically travel as far as you can while maintaining your momentum and grabbing fish to eat along the way. Points are awarded for just about everything. The game seems to be inspired by an iPhone title called Tiny Wings. 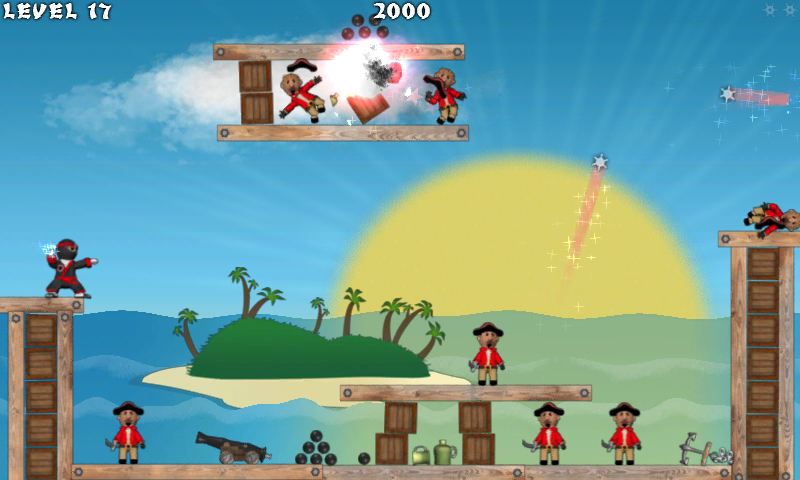 The gameplay is smooth and simple to master with a tap being the complete control scheme. 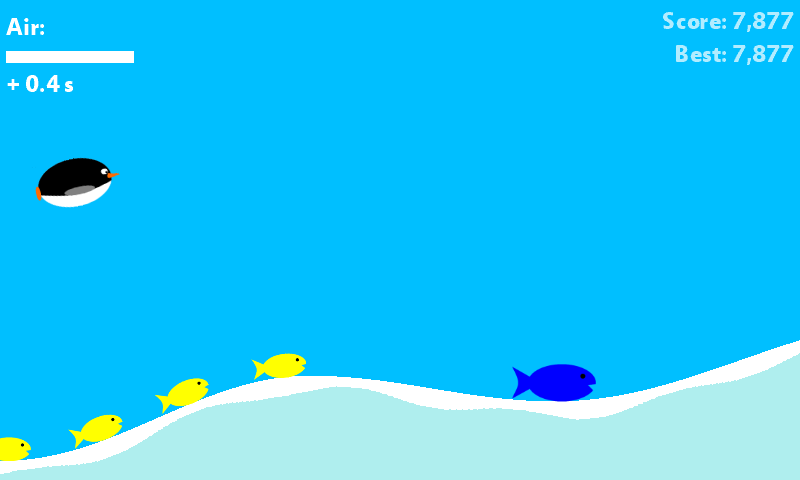 visuals are pretty basic and reminiscent of a flash-based game you might play in a browser on the desktop. Best of all…it’s free. There are 14+ stages and each game will be different as each level is dynamically created. This is the type of game I go to when I’m standing in line at the store or waiting in line at a drive thru. 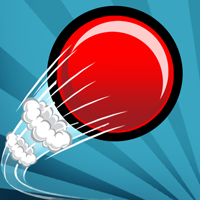 It’s quick, simple and you’ll want to keep playing to beat you and your friends scores. You can check out this free, ad-supported title in the Marketplace by searching for “Penguin” in the Zune PC software or on your Windows Phone.